In Bengali it is said that “Baro Mase tero parbon” (There are thirteen festival in twelve months). 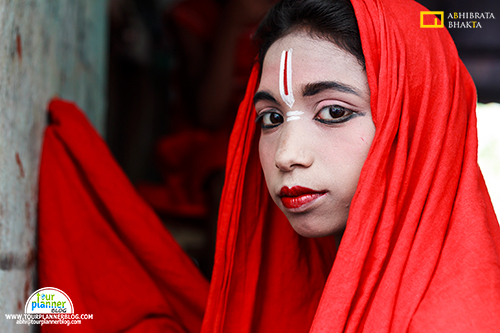 Gajan is one of the folk festivals celebrated mostly in West Bengal and few parts of Orissa. Siva, Neel, Dharmathakur such deities are in associates with Gajan festival. The main theme of the Gajan festival is deriving satisfaction through non-sexual pain, devotion and sacrifice. Here devotees dressed up as Siva, Parvati and Krishna. How to go: Reach Hazra Crossing then walk towards Alipore along with Hazra Road. After a while you will reach Patua Para. Nearest Metro Station: Jatin Das Park. Here devotees hang from ‘Charak Tree’ and they are tied with ropes and cloths. How to go: From Girish Park start walking towards Sovabazar. After few minutes of walking take right on Ramdulal Sarkar Street. You will find a market on your right side. Inside the market there is a big open area where Gajan takes place. If you wish to experience total essence of Gajan festival then this a right place for you. Here devotees dressed up as ‘Sang’. From Siva to Mahisasur you will find everyone here. Nearest Railway Station : Bhagnapara. How to go: Take a train from Howrah/Sealdah get down either at Ambika Kalna or Bhagnapara. From there take local van, rickshaw, motor van and reach Krishnadevpur high school. Unlike normal rituals, devotees here walk with human skull. This place came in news many times. People here dressed up like Krishna, Shiva, Radha, Kali. How to go: Take a train from howrah and reach Budwan. At Budwan go Tinkonia bus stand, take bus for Khurhmun. It is only 17km from Budwan. Here devotees pierce their faces with big sized pin during charak festival. Here devotees display activities with fire. How to go: Take a train from Sealdah to Diamond Harbor, get down at Gurudasnagar station. You will find many people going to enjoy Charak festival. Follow them. The festive place is near to station. Here devotees jump from Charak tree on sharp weapon. Nearest Railway Station: Jaynagar Majilpur Halt. How to go: Take a train from Sealdah to Laxmikantapur and getdown at Jaynagar Majilpur Halt. The festive place is near to station. 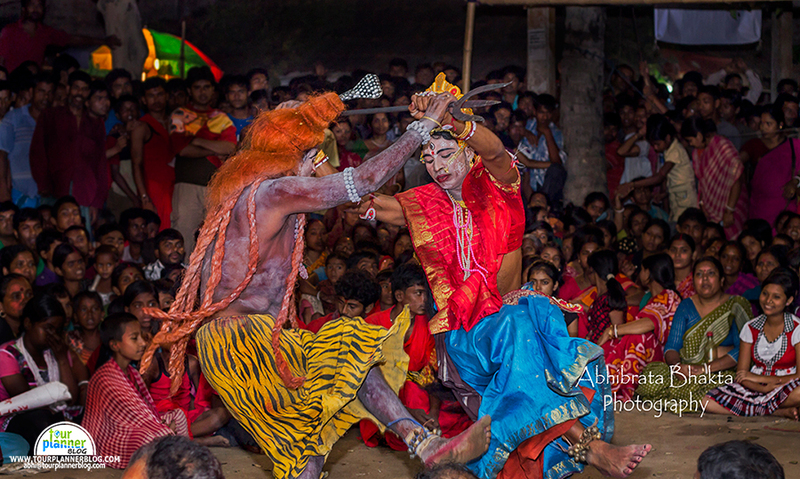 Here you can see a unique perform by devotee called ‘Nara Rakkash’ (Human Demon). Nara Rakkash become more powerful on that specific day and he has to control by 10-12men. How to go: Take a train from Sealdah to Shantipur. After reaching Shantipur station ask local how to reach charak mela, they will guide you well. Approx 300years old Gajan festival. This mela continues for seven days. How to go: Take a train from howrah to Midnapur. Reach midnapur it will take 3:30-4hours then take a bus to reach kesh pur. Ask local people how to reach charak mela they will guide you . 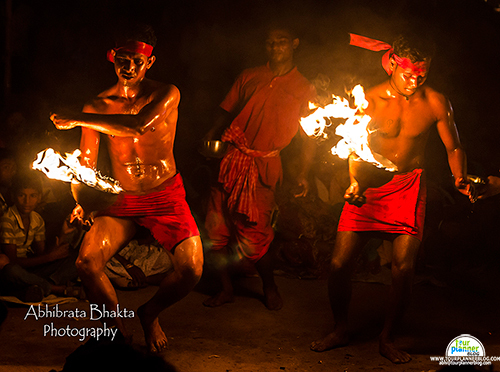 As usual like other places here devotees also do various kind of activities including piercing, fire play. 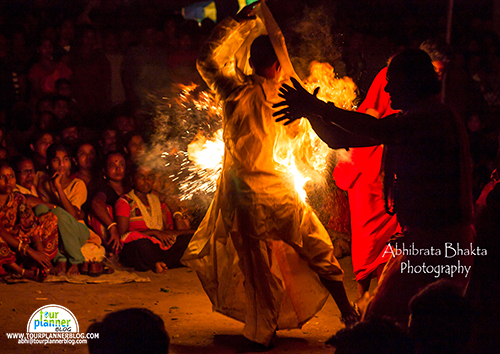 Fire play is common among devotees here. How to go: Take a train from Howrah to Midnapur/Kharagpur. Get down at Balichak station. Then take a bus or tot to reach Debra. Ask any local about the fair they will guide you. How to go: Take a train from Howrah to Midnapur/Kharagpur, getdown at Balichak. From there take a trekker or bus to reach Sabang. From Sabang take a van to reach Khepal High School ground. Khepal is around 30km from Balichak. Bainan, bagnan: You will find various acrobatic activities here. How to go:Take a trin from Howrah to Bagnan. After reaching Bagnan take a bus to Bainan. Here you will find maximum number of towing from Charak tree. How to go: Take Lalgola Passenger from Sealdah or Kolkata station then reach Beldanga. Ask local people about charak mela. They will guide you. 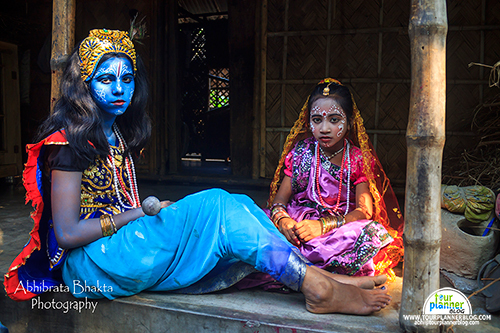 One of the oldest Charak festivals of Bengal. How to go: Take a train from Howrah to Bishnupur. From Bishnupur station hire a car and reach Panchal. Panchal is 22km from Bishnupur Station.